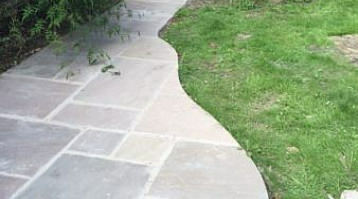 Don’t be tempted to put in that extra curve, often with with a patio, less is more. ‘Extra curves’ is a phrase full of connotations, but in this case I’m only going to talk about patios, so if you’re a lady of a ‘certain age’ like me or indeed anyone else, you can relax because today, I’d like to talk about curves in the garden. Lots of clients say they like to have curved paths, patios, ponds, walls and lawns in the garden which, done in the right way in the right place, can look really good. However, a curve in the wrong place just looks down right wrong. The problem I see the most often is that people give in to the temptation to put in too many curves and when that happens the whole effect looks fussy and not quite right. This is what my colleague Nath calls ‘creative meandering’ which I think is a very good description. If you look at the photo attached to this blog, I’m sure you can begin to see what I mean. The person who laid this piece of paving will have spent a lot of time cutting the stone and working out where to put those curves and although it’s been done well, the impact of the workmanship has been completely lost, in my opinion, because my eye was taken by too much ‘meandering’. It would have been much more pleasing on the visual front and taken less time (and therefore cost less) to do if there had just been one sweeping curve. A single curve would have looked strong, purposeful and much more natural in appearance. I understand that very few people go into their gardens and intentionally analyse the hard landscaping in this way but it IS something we all do at a subconscious level – we all do it, all of the time. So it is worth getting your curves right, as it a vital part of making your garden look and ‘feel’ right. If you’re planning some curved hard landscaping or re-shaping your lawn this weekend, get some marking-out spray paint and spray onto the ground the shape you think would work best. If you can, look down at the new shape from an upstairs window and see if it looks natural or if it feels right to you. If you cannot look down at the new shape, step back and try and be as objective as possible about it. Take a break of at least 12 hours and then go back and look at it again. Sleep on it. The goal is to create a shape that looks as if Nature could have created it and if the curves you’ve spray painted onto the ground look natural, then go ahead with the work. If not, have another go! The spray paint will come off and no harm is done. Is your garden a burden?